Commentary on the Apocalypse, Part 1: From Christ with Love, by St. Beatus of Liebana. Translated by M. S. O’Brien. The first ever English translation of Beatus’ great medieval book of commentary on the Book of Revelation! Wise words from early Christianity are blended with timeless advice on how to live in a world where not every Christian is holy. In Part 2, John sees the Door to heaven open, and then God’s Throne surrounded by saints and angels. He sees the Lamb unseal six of the seven seals, as well as the Four Horses and other signs of the Apocalypse. He also examines various calculations of the date of the end of the world, and why it’s not a good idea to try to outguess God. 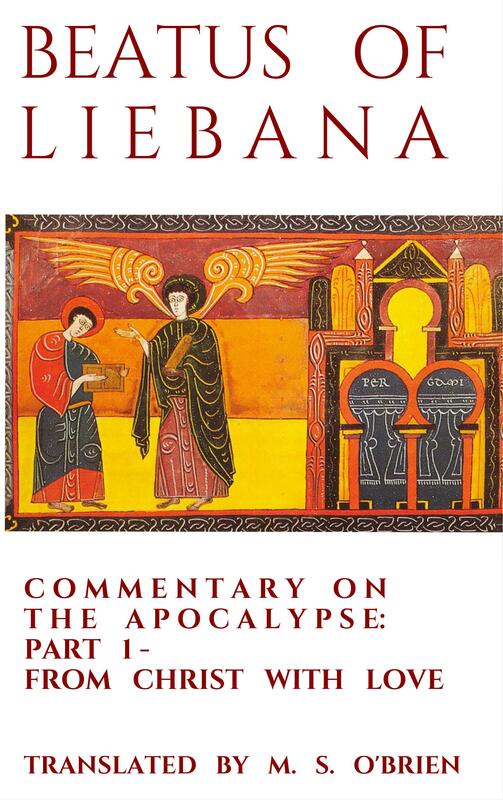 Includes a full translation of Books III and IV of Beatus’ Commentarius in Apocalypsin (covering Revelation chapters 4-7), an appendix with translated excerpts from contemporary writers talking about Beatus, as well as extensive indexes and a bibliography. Two more volumes will be forthcoming. 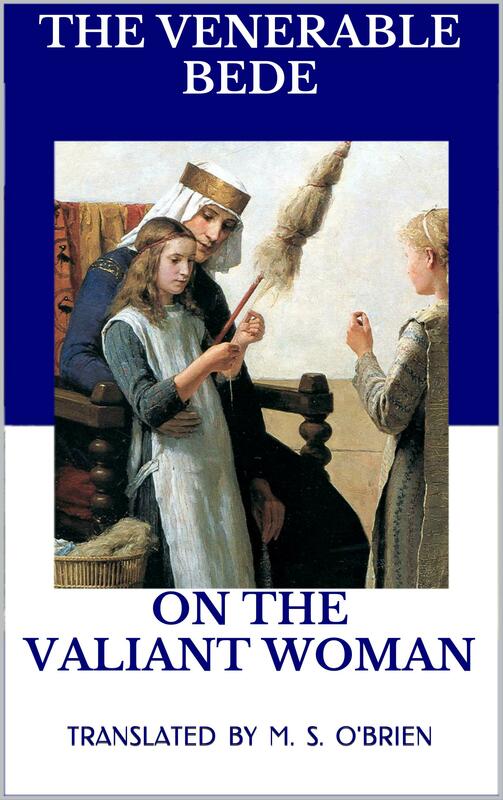 On the Valiant Woman (De muliere forti) by the Venerable Bede. This classic early medieval Bible commentary on Proverbs 31:10-31 is both a Bible study and a call to action in our everyday lives. If Christ is the Bridegroom and the Church is His Bride, what can we learn about her from the Valiant Woman, the ideal businesswoman and wife? As part of Christ and His Church, how do we take the initiative is using our talents for other people’s good? On Magic by Fr. Francisco de Vitoria, O.P. Did magic exist? Could it perform miracles? Could it be done without dealing with the devil? Did people using magic even realize the moral implications? And had perfectly natural scientific curiosities, like magnetism, often been mistaken for magic? Never before translated into English, here is an interesting glimpse into a world in transition between medieval and modern, as classical literature, philosophy, and patristics meet Spanish folklore. Part 1 focuses on the seven letters Christ sends with love to the seven churches in Chapters 1-3 of Revelation, while also including broad overviews of how to interpret the whole book. (This includes Beatus’ prologues, the Summa Dicendorum, and Books 1 and 2 of his Commentary. Plus tons of footnotes, a Bible quote index, and a bibliography.) About 375 pages. Beatus was a monk and priest from the famous mountain monastery of Liebana (Lebanon) in the kingdom of Asturias, in Spain. It is a particularly nice version of this verse. Really am enjoying the mysteries. Would you consider doing Sheila Kaye-Smith’s books? A convert to Catholicism from Anglo-Catholicism. Searching for Lillian Campus from SWEDEN. Mail to: onsketrojan@telia.com if you find her. I don’t know if you’ve heard, but Lloyd Alexander passed away last Thursday. He died of cancer, in hospice care, two weeks after the death of his wife of 61 years. He was 83 years old. Requiescat in pace to both of them. These videos are part of a new project called, “Is This What You Mean?” It aims to educate the public about the nature of abortion and to challenge public officials and candidates who support the legality of abortion to admit what it is. A full description of the project is at http://www.priestsforlife.org/action/abortion-procedure-revealed.htm . Sooo, you like-a da musike celtique? Good friend from Pittsburgh sends me your way. Would love to correspond if you like. I’m new at this blogging and actually just slipped into this site because of a comment (*nice comment) written by a priest re: the celtic contributions of a Maureen. I’m looking for some “good old fashioned”, Irish influenced, Catholic information, the kind that Fr. Andrew Greeley writes about in his fiction. Is this such a place? Good stuff here. Thanks for the effort. I am Orthodox, having come in from the evangelical protestant realm. I appreciate your grasp of the Early Church Fathers and Scripture. If we can all keep all 3 legs of the stool we use to seek truth, 1. Scripture, 2. Holy Tradition, and 3. Reason, we could have a better platform to be the body of Christ in this fallen, broken world. Sad to see many 2 and even one legged stools around us falling. Hey, great site. I found it because I was looking for counterarguments to the extreme modesty people who wanna ban pants on women. These people have been getting on my nerves lately. One thing I’d love to see you address: the issue of “Marylike modesty,” as in only wearing clothes the Blessed Mother would wear. I know she is supposed to be a role model to all Catholics, but should it go this far? One guy I read on Catholic Answers says he makes his daughter go jogging in a long skirt, ’cause hell is hotter than the 90-degree weather. Or how would you address the Saints like John Chrysostom who claim women should always be veiled in public, not just in church… it certainly seems like most saints would in fact be scandalized by even our modern modest styles, not to mention swimsuits and sportswear. I personally would follow what JPII had to say on the issue, as well as a good dose of common sense, but you seem to be much more well-versed in issues like this than I am, so I’d love to see your take on it. Anyway, God bless you and keep it up! The point of prudence is to go from principles to specifics, without erring either through being overly harsh/strange or overly worldly/conformist. St. Francis de Sales talks about this. I’ve recently been trying to unscramble the age of the world calculations Beatus uses, and will post about this. I guess you have seen the 2012 edition of Beatus edited by Roger Gryson in the Latina series of Corpus Christianorum, SL 107B-C.
Noooo, I haven’t seen that at all. Thanks for letting me know! Excellent Site! I love it. Page 87 in “THE BLESSED VIRGIN IN THE FATHERS OF THE FIRST SIX CENTURIES” seems to be a dead link. Could you fix this? Hi suburban banshee. I wonder if you could drop me a line please? I just wanted to touch base with you again concerning the Glossa Ordinaria. I am about to publish a translation of the Gloss on the Epistles of 1-3 John, which I am very excited about. I had a team of translators work on it, and it has surpassed my expectations. I am still continuing to build the project, especially a series of volumes. I just wanted to extend an invitation to you to see if you would be interested in getting involved in the Glossa Ordinaria project. I have two areas of this project in which one is the publication of volumes of the Gloss in print, and the other is for unpublished translations to put on a website for free access, for translators to experiment with the Gloss and study it, and for others to have at least a free access to Glosses in English. I just reviewed “Four Horses and the Lamb” on Amazon. I am amazed at your scholarship!